The news could fundamentally alter the financial calculus that drove PG&E to announce bankruptcy plans. California fire investigators have cleared Pacific Gas & Electric of starting the 2017 Tubbs Fire that killed 22 people and caused an estimated $17 billion in damages, a finding that could offer the utility financial relief as it prepares to file for bankruptcy protection. Thursday’s announcement from the California Department of Forestry and Fire Protection (Cal Fire), based on a 16-month investigation of the fire that ravaged Napa and Sonoma Counties in Oct. 2017, traced the start of the blaze to a private electrical system next to a residential structure, and not PG&E’s equipment, as had been suspected. The news could fundamentally alter the financial calculus that drove PG&E to announce last week that it plans to file for Chapter 11 bankruptcy reorganization by the end of January. The utility said it faces an estimated $30 billion in potential liability damages from California’s deadliest wildfires of 2017 and 2018. That figure is largely made up of two fires — the Tubbs Fire, which caused an estimated $15 billion to $17 billion in damages, and November’s Camp Fire, which killed 86 people and caused damages estimated at $16 billion or more. This finding is critical, because under California’s “inverse condemnation” legal standard, utilities can be held liable for damages caused by fires started by their equipment, even if they weren’t at fault and had followed all laws and rules for keeping it safe. The inverse condemnation standard would not apply to equipment owned by another party, however. Cal Fire did determine in May that PG&E lines were the cause of several fires that killed at least 15 people and razed over 5,000 homes in the fall of 2017, including 12 instances in which it found the utility in violation of safety or maintenance procedures. But those fires were far smaller than Tubbs. PG&E still faces massive liabilities from the Camp Fire, however — and the circumstances surrounding that fire are quite different from the Tubbs Fire. Early reports and ongoing investigations have clearly linked the start of the Camp Fire to the failure of equipment at a PG&E-owned and -operated transmission line. PG&E has also been faulted for its decision against de-energizing power lines in the area in the days before the blaze. The state law passed in September to offer PG&E the ability to raise ratepayer-backed bonds to cover its 2017 wildfire liabilities doesn’t currently extend to 2018 fires, which would exclude the Camp Fire’s liabilities. The lawmaker who launched a legislative effort to amend the law to allow bonds to cover the costs of 2018 fires publicly announced he was scrapping the effort after PG&E’s bankruptcy announcement last week. "Regardless of today’s announcement, PG&E still faces extensive litigation, significant potential liabilities and a deteriorating financial situation, which was further impaired by the recent credit agency downgrades to below investment grade," said Paul Doherty, PG&E spokesperson, in an emailed statement. 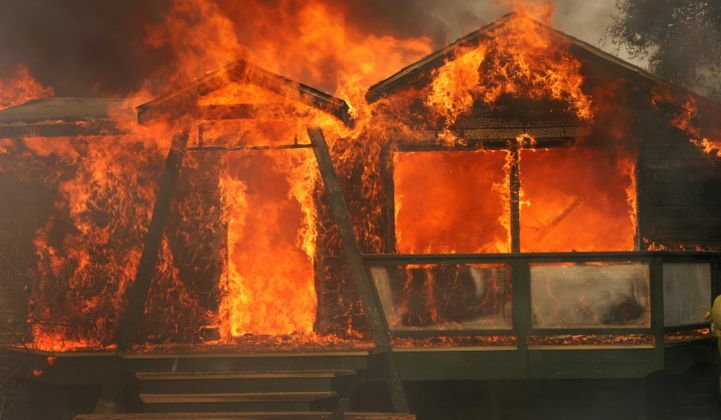 "Resolving the legal liabilities and financial challenges stemming from the 2017 and 2018 wildfires will be enormously complex and will require us to address multiple stakeholder interests, including thousands of wildfire victims and others who have already made claims and likely thousands of others we expect to make claims." PG&E's stock shot up by more than 70 percent Thursday, closing at $13.95 per share, following Cal Fire's announcement. Shares were buoyed days earlier with the news that PG&E had secured $5.5 billion in debtor-in-possession financing as it prepares to file for Chapter 11 bankruptcy protection. But PG&E's stock is still way down from around $70 per share in early October 2017, before the Tubbs Fire hit. Earlier Thursday, investor BlueMountain Capital, which owns roughly 1 percent of PG&E shares, called for the utility to dump its entire board and nominate all new directors. BlueMountain previously called for PG&E to halt bankruptcy preparations, arguing that it would have adverse impacts on all constituents. A BlueMountain spokesperson said later on Thursday that Cal Fire's Tubbs Fire finding "is yet another example of why the company shouldn't be rushing to file for bankruptcy, which would be totally unnecessary and bad for all stakeholders,"
PG&E has stated in recent court filings that such an effort would require hiring hundreds of thousands of workers and cost between $75 billion and $150 billion. For more on PG&E’s ongoing flirtation with bankruptcy, click here.